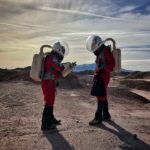 Homo Ludens: Training for a Martian Olympiad. 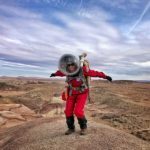 As the MDRS Crew 188 artist-in-residence, I actively champion the support and integration of working tolerances for play and performance within mission architectures and EVA simulations. 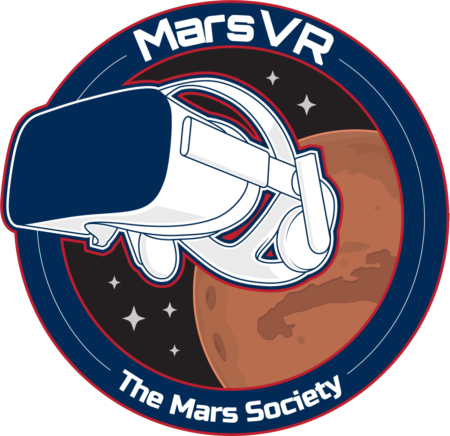 In preparing for this mission, I initiated a challenge to the ISU Crew 188 for the training and preparation for a Martian Olympiad event at MDRS to coincide with the Opening Ceremony of the Winter Olympics on 09 Feb 2018. Prior research shows that play and performance is beneficial for individual physical and psycho-spiritual health and crew wellbeing on Earth. Future crews on Mars will be no exception. 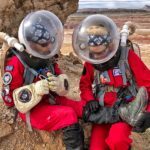 Today MDRS Crew 188 – EVA 4 with Julia De Marinares, Dr. Ryan Kobrick, and I (Dr. Sarah Jane Pell) designed a series of tasks specifically for the purpose of encouraging exertion and teamwork [See EVA and Journalist report]. We discussed the parallels between training for an Olympic event, and training for a Mars Mission. During the pre-flight phase, Astronaut candidates undertake training for the acquisition and development of prerequisite physiological, psychological, psycho-spatial and human-factor benchmarks to perform in space, and manage pre-flight expectations. During pre-performance phases, Athletes undertake a parallel journey in the lead-up to a world-class performance event like the Olympiad. Pre-flight is a time for the rehearsal of the time-tagged performance maneuvers, learning NomOp, and balancing expectations. Astronauts also learn from the questions arising about the temporal proximity required for relating live action and collective action between positions, locations and communication networks, real and illusory, in the altered gravity environment of space. For example, practical Extra-Vehicular Activity (EVA) or spacewalk training prepares the candidates for new space/spatiality. 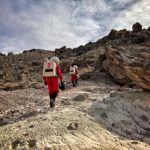 Today, our EVA prepared for the marathon tasks of a long-walk with equipment, a mountain summit and safe decent, another long walk, and a ball game testing coordination, concentration and response-time after our exertion. The exercise was physically demanding as we anticipated, but our team-work, problem-solving, cooperation rather than competition, outlook and sense of adventure and fun, made it the best day out on the surface of Mars yet! We respect that forms of play and performance in space differ from Earth-based activities due to the unique aspects of human-space physiology, perception and environment. 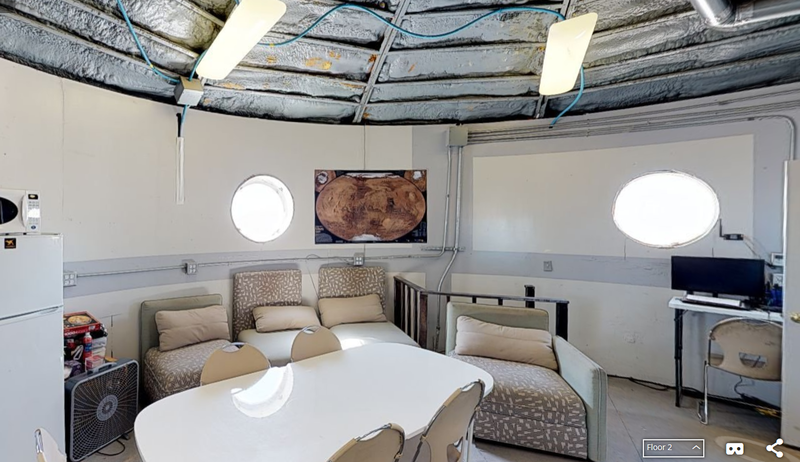 Back at the MDRS Habitat, conversations continued with Engineer Zac Trolley about the challenge of sharing that kind of experience in the moment of discovery with an audience or end user so encourage them to want to take up the spirit of exploration, like a mantle, and to conceive of a life beyond Earth. We discussed how returning Astronauts go through a process of Space-Earth Adaptation. The encumbrances of returning to Earth including sources of stress such as gravity, motion, obstacles to and facilitators of adequate coping, changes in social interaction, the role of temporal factors relating to mission objectives quickly fade. 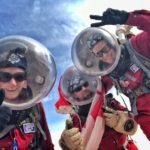 After experience-rich engagements in space, post-flight Astronauts fill autobiographical accounts with a lingering sense of adventure and accomplishment, enjoyment and fulfillment. But in the many-to-many information-filled world, we had to find a new form, and a new story, to transform the lives of those who may not yet have the spark and fervor for space exploration. We talked about the inspiring works of game-developer and Astronaut Richard Garriott and his investment in SpaceVR. We are now exploring the potential for our Crew to play a role in developing a VR product. Let’s jump to the bottom line. My hiking boots were completely destroyed on our hike to Phobos Peak with the soles peeling off the bottom. An EVA with modest to difficult objectives was challenged with equipment failures and ingenuity to solve problems as they occurred. This is the type of exploration we need for a Mars mission. Calculating risks, making decisions, and with collective exploration experience solving problems. There’s going to be a lot of problems. The EVA Macgyver of the day was Sarah Jane, fixing one boot with a safety whistle, and the other with my laces and some zip ties I was using. Between Julia, SJ and I we were challenged physically and mentally. I had suggested Phobos Peak for the EVA, and I was clearly willing to lose my boots over it. Luckily my hiking shoes are rugged and ready to step up to the next EVA challenge. The crew enjoyed the scenic views from the science dome during a session of Kung Fu Thai Chi in the morning. Every morning needs to start off on the right foot… even if part of your foot falls off later. 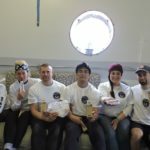 The crew also cracked into Cottage Cheese with Blackcurrant Puree space desert from the Russian Space Food Laboratory. It’s apparently “approved by space”. 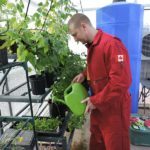 Further work continued on the NASA VEGGIE OASYS project in the Green Hab. We also finally opened the dust load experiment that I am running from NASA Glenn Research Center. I’m excited to set up the hardware and see how much dust we are tracking into the hab. It’s a dusty environment, and knowing how dirty it gets during key activities (EVA airlock, post EVA clean up, and more) we can help prepare future life support systems with the correct type of filters. EVA 5 is planned for tomorrow to revisit a site from EVA 2 and to further add navigation and waypoint data for the crew to use on all EVAs. Meanwhile several other projects will be underway inside the dome. MDRS Director is coordinating power system updates with contractors. There was a site visit today. Robotic observatory currently not functional. MDRS Astronomy lead working problem. The weather was clear until mid-day when clouds rolled into the area. It was a busy day all around, so we are looking at our mission ahead to plan out key EVAs, science projects, and fun activities to make sure we are having a well-balanced experience. One is on the books for tomorrow. 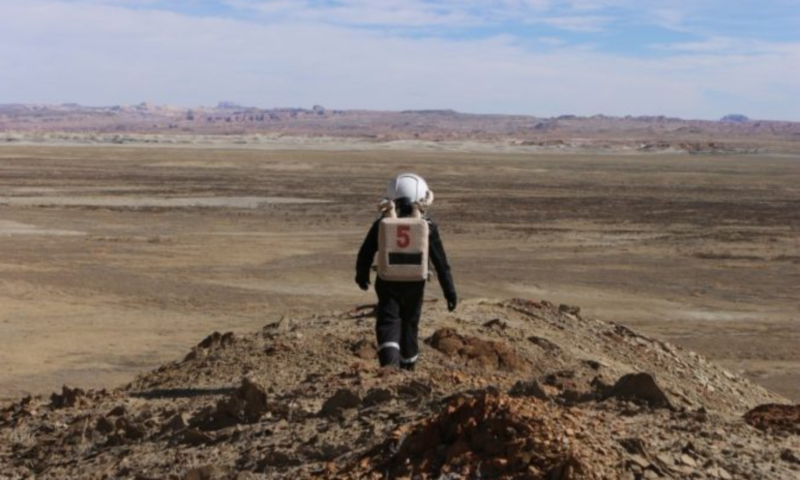 Purpose of EVA: To test human endurance on a pedestrian EVA to Phobos Peak and test the 360 video capture in the field. 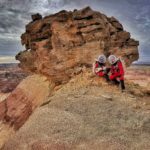 The crew faced equipment challenges (see Sol 4 Summary Report) but was able to overcome and persevere to meet the mission goals. The investigators have high hopes for the data collected, but regardless experienced a true Martian adventure. 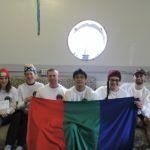 General notes and comments: The Hab Director mentioned that the Rovers required an extension cord that is shorter than 25 feet. We estimate the cords being used now are 50 foot cables. I was able to find a 25 foot extension cable, meaning we could charge one rover at time based on the above specifications. Can we have the appropriate extension cables sent to the Hab in order to charge the Rovers? Also, the configuration the rovers are in means that the rovers need to back out before they are used. Backing up in an EVA suit is hazardous since you can’t see behind you in a suit. Please advise if there is another configuration that allows charging with a 25 foot extension cable as well as the ability to drive forward during EVAs. Summary of Hab operations: The microwave isn’t working anymore. The buttons work, the time counts down, but the microwave doesn’t actually produce waves to heat anything. Summary of EVA operations: We are still brainstorming ways to combat the helmet fog. Without proper ventilation under the helmet ring, the facemasks rapidly fog up. It is becoming a safety issue on EVA. Summary of Science Dome operations: The science dome is awaiting a portable heater as per the Hab Director. Summary of RAM operations: Not Operational. Summary of health and safety issues: The propane detector has arrived, and there is a positive detection of combustible gas in the hab. We calibrated the sensor outside, and moving the detector in different places in the Hab clearly shows that there are areas where there is a higher concentration of combustible gas than others. The instrument is of low quality and does not show us the ppm, so we have no way to tell what the levels are, and if they are dangerous.